The Pathfinder Foundation (PF), since its inception has consistently argued in favour of cost reflective pricing for every State Owned Enterprise (SOE). This is based on the premise that losses of SOEs are invariably a burden on the public, particularly the poor and vulnerable, in one way or the other. In practice, the public are equivalent to the shareholders of these enterprises. The losses incurred by SOEs have eventually to be borne by the public in the form of higher taxes and/or interest rates. As 80 per cent of Government revenue is collected from regressive indirect taxes, the pain is borne disproportionately by the poor. While arguing for cost reflective pricing, the PF also unquestioningly accepts the need to support poor, disadvantaged, unable – to – buy consumers. However, subsidising of products or services sold by SOEs is the most inappropriate and misguided instrument for supporting these deserving groups in society. Instead, they should be provided a safety net through well designed and well targeted transfer payments, such as a voucher system for electricity payments or a complete re-haul of the poorly targeted Samurdhi programme. A second best option is to increase the Samurdhi payments in spite of its deficiencies in its present form. In this context, it is, therefore, disappointing that the government has modified its original proposal by reducing the tariffs to be charged for those consuming less than 180 units. This continues to distort prices and discourage much needed conservation. Also, backtracking from good policies sends bad signals to prospective investors and opportunistic groups and parties. The position of those who oppose an increase in electricity tariffs is an ugly reflection of opportunism and the lack of clear a policy line. In the medium, to long term, this is certainly not a pro-poor position as it will inevitably lead to a de-stabilisation of the state banks with serious ramifications not only for the financial system but for the whole economy. 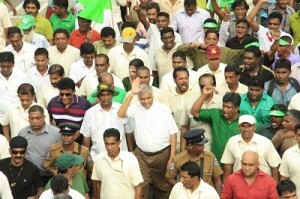 Such inconsistency and political opportunism has been a major drag on Sri Lanka’s economic prospects for many years. The time has come now to face-up to reality, particularly as the country is becoming increasingly exposed to the brutal discipline that is exercised by international capital markets. As the PF has emphatically stated, the CEB should not only move to cost reflective pricing supported by effective restructuring but also be subjected to institutional reforms to improve the operational efficiency of generation, transmission and distribution of electricity. In addition, it is important that Sri Lanka adopts a strategic approach to power generation over the next 15-20 years. In the past, the mismanagement of the transition from hydro to coal has been enormously costly to the people and businesses of this coutry. It is crucial that a similar mistake is not repeated and a clear strategy is established regarding a transition to the most cost effective mix of power generation, including the shift to Liquefied Nitrogen Gas (LNG) and other alternative energy resources.